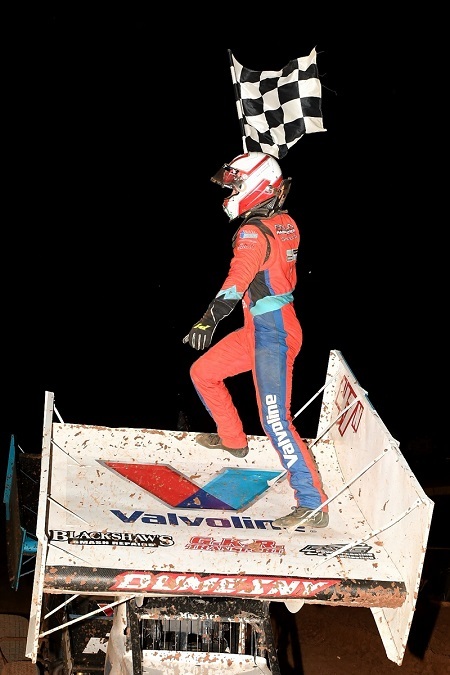 Marcus Dumesny scored the second feature-race win of his career last Saturday night at Valvoline Raceway, taking out the Ultimate Sprintcar Summer Slam on what was a very challenging race track, after a freak storm hit the venue 24 hours earlier. In what was regarded a miracle that we even turned a wheel after the storm inflicted damage to the venue, Valvoline Raceway management worked extremely hard to get the track, which was under water, and the spectator area suitable for the meeting to go ahead. The front row of the 30-lap feature race saw experience versus youth with Robbie Farr on pole position and Jessie Attard next to him. Having one of his best nights to date this season, Jeremy Cross started in third and Matt Dumesny completed row two. Farr immediately jumped into the lead before an early red light was called for as Ben Atkinson flipped in turn three. At the ensuing restart, Daniel Cassidy also retired with a damaged front end. Once the race began again, Marcus Dumesny made his move from position five to second, shuffling Attard back to third, Cross to fourth and Matt Dumesny to fifth. Just one lap later Farr was passed for the lead and from that point on, Marcus Dumesny was unchallenged for the lead until the chequered flag fell, on lap 25 with the feature race being shortened due to the looming curfew. Following Marcus Dumesny home was Farr, ahead of Matt Dumesny, Sam Walsh who was making massive inroads towards the end of the race, Jessie Attard, Jordyn Brazier, Warren Ferguson, Cross, Daniel Sayre and Danny Reidy completing the top-10. Eleventh home was Michael Saller from Jackson Delamont, Max Dumesny, Grant Tunks, Luke Stirton, James Thompson, Ben Atkinson Jr and the final finisher was Kris Johnson who qualified for his first feature race. Non-finishers were Damien Hart, Jamie Veal, Ben Atkinson, Cassidy, Kyle Angel and Troy Little who was disqualified for noise. Earlier in the evening, there were four flights for qualifying held. Farr was quickest in flight one, Matt Dumesny in flight two, Veal in flight three and Cross in flight four. All except Veal turned quick time into a heat race win, with Attard winning heat three. The B-Main saw Hart grab the win from Johnson, Atkinson Jr and Angel. The Sprintcar Association wishes to congratulate Valvoline Raceway on their efforts to get the event in on Saturday night and we look forward to our next event on the calendar: The Ultimate Speedway Challenge on Saturday night, February 23.